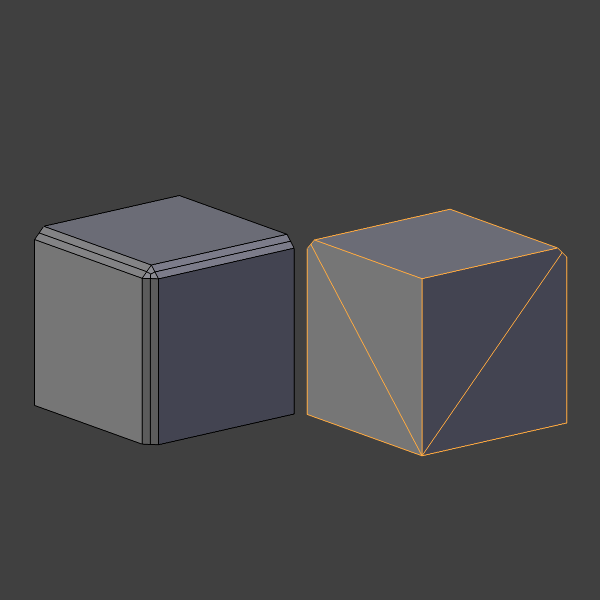 I've had my dose of 3D graphics lately, so I ended up doing some interesting observations about surface modelling. If you have a quad, you can neatly split it into two halves that also are quads in two combinations. This means you can trivially flow through a quad strip, splitting it half. If you have a surface consisting of quads then the degree of every vertex, that is how many edges it has, gets an interesting meaning. When there are 3 edges present, the quadrilateral flow seems to get attracted to the vertex and circle it. 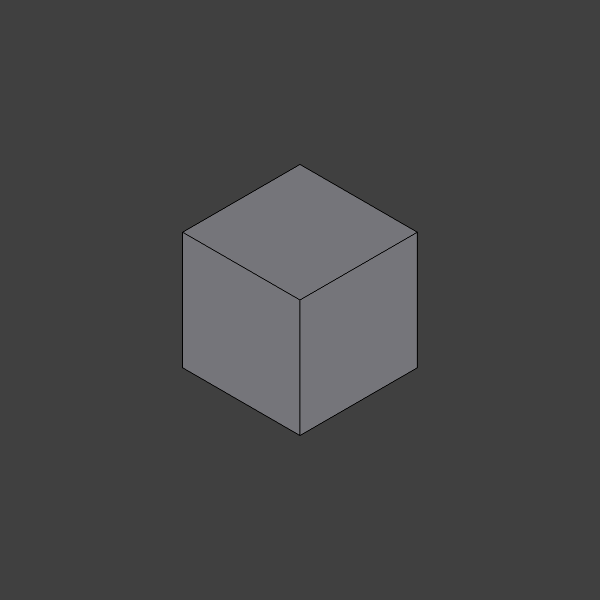 The shape alone produces an illusion of a cube. 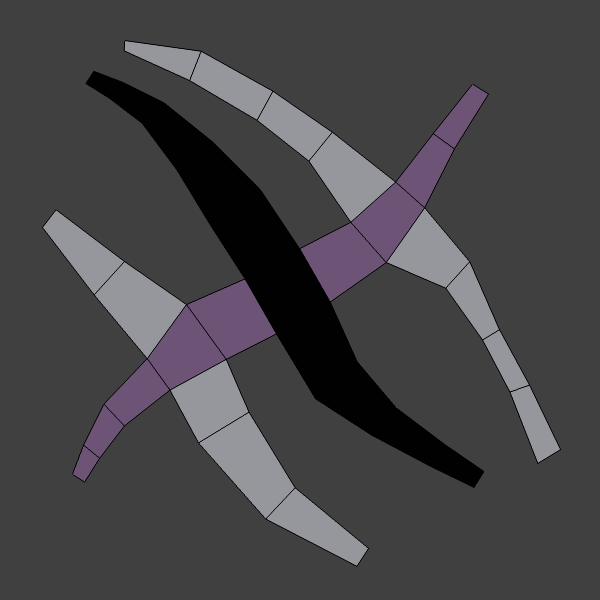 With 4 edges present, the quadrilateral flow ignores the vertex. 5 edges repel the quadrilateral flow. To get the quadrilateral flow do a loop, a quadrilateral is required to the center. Otherwise you would have to position a triangle there. 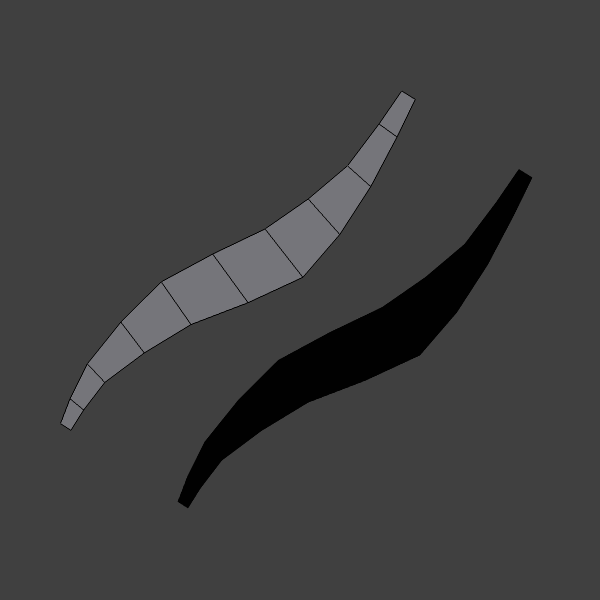 It looks as if it was extruded there. Extrusion of any set of quadrilaterals will produce new quadrilateral flows that are quaranteed to loop. The amount of edges, as long as everything is quadrilaterals, control where the quadrilateral flow is going to. In the last image it returns back to where it came from. You can make lines out of quadrilaterals. They come out to look like the ones in above, or better if you take care to reduce angle between sides of the quadrilateral loops while attempting to maintain the thickness. 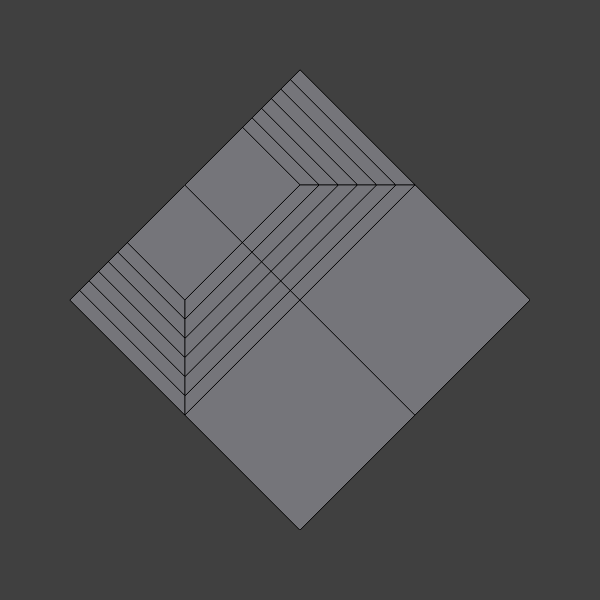 The lines cross each other at the point of each quadrilateral each line is formed of. It resembles hatching in traditional art. Highly detailed places have tigh hatching that themselves form large lines. I can't be sure, but likely every shape can be represented as quadrilaterals, and flow of the quadrilaterals. 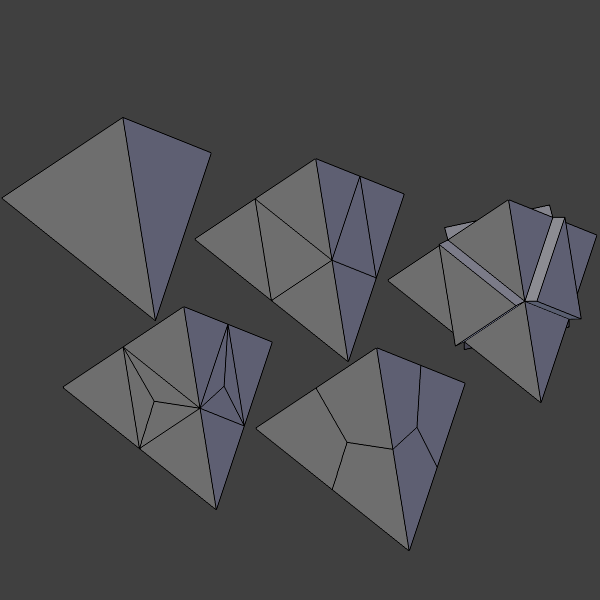 For example the tetrahedron can be turned into quads with subdivide, extrude, collapse and removing the remaining edges. 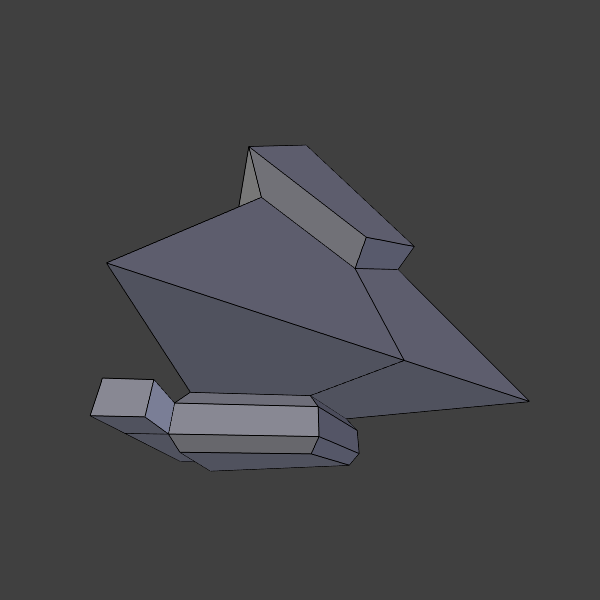 That you can turn a tetrahedron into quads may mean you can represent any object as quadrilaterals if you allow some redundant vertices. Quadrilateralized tetrahedron appears to turn into very interesting, spiky shapes after only few extrusions. 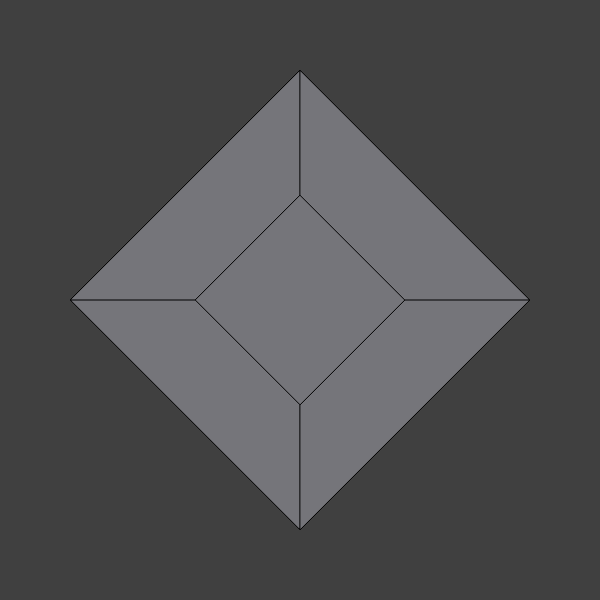 One might be interested to do the quadrilateralization for other primitive shapes. The resulting shapes are themselves quadrilaterals too. If you think about that triangle case, it may mean you can do many other operations that maintain the quadrilateral shape.